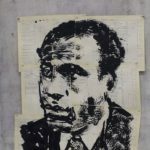 William Kentridge is one of South Africa’s pre-eminent artists, internationally acclaimed for his drawings, films, theatre and opera productions. 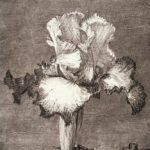 His work draws on varied sources, including philosophy, literature, early cinema, theatre and opera to create a complex universe where good and evil are complementary and inseparable forces. 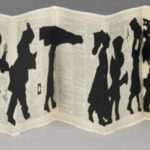 Kentridge’s work has been seen in museums and galleries around the world since the 1990s, including Documenta in Kassel, Germany (1997, 2003, 2012), the Museum of Modern Art in New York (1998, 2010), the Albertina Museum in Vienna (2010), Jeu de Paume in Paris (2010), and the Musée du Louvre in Paris (2010), where he presented Carnets d’Egypte, a project conceived especially for the Egyptian Room. Kentridge’s production of Mozart’s The Magic Flute was presented at Theatre de la Monnaie in Brussels, Festival d’Aix, and in 2011 at La Scala in Milan, and his production of Shostakovich’s The Nose was seen at The New York Metropolitan Opera in 2010 and again in 2013, traveling to Festival d’Aix and to Lyon in 2011. The 5-channel video and sound installation The Refusal of Time was made for Documenta (13) in Kassel, Germany, in 2012; since then it has been seen at MAXXI in Rome, the Metropolitan Museum, New York, and other cities including Boston, Perth, Kyoto, Helsinki and Wellington. 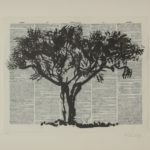 A substantial survey exhibition of Kentridge’s work opened in Rio de Janeiro in 2012, going on in following years to Porto Alegre, Sao Paolo, Bogota, Medellin, and Mexico City. In 2014 Kentridge’s production of Schubert’s Winterreise opened at the Vienna festival, Festival d’Aix, and Holland Festival. It has since been performed at the Lincoln Center in New York, in St Petersburg, Moscow and other cities in Europe. Paper Music, a concert of projections with live music by Philip Miller, premiered in Florence and was presented at Carnegie Hall in New York in October 2014. Kentridge’s production of Alban Berg’s opera LULU opened this summer in Amsterdam, and in November will be seen at the Metropolitan Opera in New York. It travels to the English National Opera in London in November 2016. More Sweetly Play the Dance is an 8-channel video projection. It was shown first in an installation at the EYE Film Institute in Amsterdam in April 2015, and will also be part of a projection biennale in Germany and an exhibition at Marian Goodman Gallery in London, both in September. Notes Toward a Model Opera, a three-screen projection looking at the Chinese Cultural Revolution, is the key work in a new survey exhibition which opened in Beijing in June this year (going on to the MMCA in Seoul and other cities in the Far East), and will also be part of a solo exhibition at Marian Goodman Gallery in London in the Fall. For the 2015 Istanbul biennale, Kentridge has made a site-specific installation of sound and video titled O Sentimental Machine. Work continues on Triumphs & Laments, an approximately 500 m frieze of figures to be power-washed from the accumulated pollution on the walls of the Tiber River in Rome – triumphs and laments in the history of Rome, and scheduled to open in late April 2016. 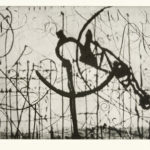 In 2010, Kentridge received the prestigious Kyoto Prize in recognition of his contributions in the field of arts and philosophy. In 2011, he was elected as an Honorary Member of the American Academy of Arts and Letters, and received the degree of Doctor of Literature honoris causa from the University of London. 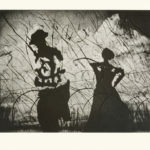 In 2012, Kentridge presented the Charles Eliot Norton Lectures at Harvard University and was elected member of the American Philosophical Society and of the American Academy of Arts and Sciences. Also in that year, he was awarded the Dan David Prize by Tel Aviv University, and was named as Commandeur des Arts et Lettres by the French Ministry of Culture and Communication. 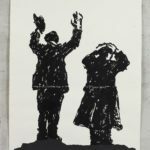 In 2013, William Kentridge was awarded an Honorary Doctorate in Fine Arts by Yale University. In 2014 he received an Honorary Doctorate in Literature from the University of Cape Town, and in 2015 was appointed as an Honorary Academician of the Royal Academy in London. Title/Tale (with Stephen Sack and Jemima Hunt), 8 mm animation, 2:00 min. 8 mm flipbook animation (untitled), 2:00 min. Co-directs Howl at the Moon with Hugo Cassirer, video fiction, 40:00 min. Salestalk, 16 mm film fiction using actors, transferred to video, 30:00 min. Vetkoek/Fête Galante, 16 mm animated film with actors and drawing, transferred to video, 2:41 min. 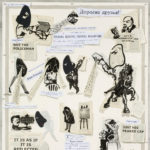 Exhibition, 16 mm animated film using drawing and actors, transferred to video, 3:00 min. Co-directs with Angus Gibson Freedom Square and Back of the Moon, documentary on Sophiatown for Channel 4, UK, 50:00 min. Johannesburg, 2nd Greatest City after Paris (from Drawings for Projection), 16 mm animated film transferred to video, 8:02 min. 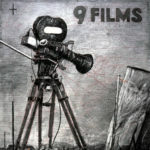 Directs T&I, video fiction with actors, 12:00 min. Monument, 16 mm animated film transferred to video, 3:11 min. Mine, 16 mm animated film transferred to video (with the addition of colour and sound), 5:50 min. Sobriety, Obesity & Growing Old, 16 mm animated film transferred to video, 8:22 min. Easing the Passing (of the Hours), in collaboration with Robert Hodgins and Deborah Bell, computer animation transferred to video, 10:00 min. Felix in Exile, 35 mm animated film transferred to video, 8:43 min. 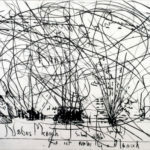 Memo, in collaboration with Robert Hodgins and Deborah Bell, 35 mm animated film using live actor and charcoal drawing, transferred to video, 3:00 min. History of the Main Complaint, 35 mm animated film transferred to video, 5:50 min. Ubu Tells the Truth, 35 mm animated film with documentary photographs and 16 mm archival film transferred to video, 8:00 min. WEIGHING . . . and WANTING, 35 mm animated film transferred to video (color, sound), 6:20 min. 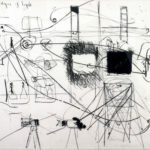 Hotel, with Robert Hodgins and Deborah Bell, collaborative animated film using charcoal drawing, in two different versions, 5:43 min. and 4:00 min. Shadow Procession, animated film using three-dimensional objects and paper cut-out figures, 7:15 min. Stereoscope, 35 mm animated film transferred to video, 8:22 min. Sleeping on Glass, animated film using three-dimensional objects, a live actor, and charcoal drawing, 8:11 min. Overvloed, animated film for oval domed ceiling using paper cut-out figures, shadows, text fragments, charcoal and pastel drawing, water and video footage, 6:00 min. Medicine Chest, video rear-projected on medicine chest mirror, animated film, 35 mm, video and DVD transfer, 5:50 min. 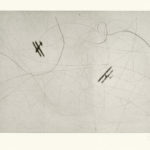 Zeno Writing, 35 mm animated film using charcoal and pastel drawing, footage of theatre performance, documentary material from First World War, transferred to video, 6:00 min. 7 Fragments for Georges Méliès, installation of seven film fragments (Invisible Mending 1:30 min; Moveable Assets 2:40 min; Autodidact 5:10 min; Feats of Prestidigitation 1:50 min; Tabula Rasa I 2:50 min; Tabula Rasa II 2:10 min; Balancing Act 1:20 min, 16 mm and 35 mm) films transferred to seven-channel video; Day for Night, 16 mm film transferred to video, 6:32 min; and Journey to the Moon, 35 mm and 16 mm film transferred to video, 7:10 min. Automatic Writing, 35 mm animated film transferred to video, 6:00 min. Learning the Flute, 35 mm animated film transferred to video and projected on blackboard, 8:02 min. Preparing the Flute, miniature theatre with drawings (charcoal, pastel and coloured pencil on paper) and front and rear projections from 35 mm animated film transferred to video, 21:06 min. 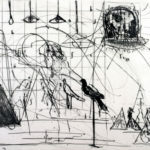 Black Box/Chambre Noire, miniature theatre with drawings (charcoal, pastel, coloured pencil and collage on paper), mechanical puppets, and back and front projection, including 35 mm animation and documentary footage transferred to video, 22:00 min. What Will Come (has already come), projection installation with table, drawing paper and cylindrical steel mirror, and 35 mm animated film transferred to video, 8:40 min. 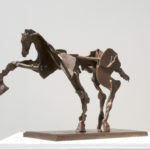 I am not me, the horse is not mine, 8-channel video installation, 35 mm film and video using animation, live action and archival footage, transferred to video, 6:00 min. Breathe Dissolve Return, video triptych, DVCAM and HDV, using sculptures, live actors, torn paper animation, transferred to video, 6:00 min. Anti-Mercator, 35 mm film and video using drawing, animation, live actors, transferred to video, 9:45 min. Other Faces, 35 mm animated film transferred to video, 9:45 min. The Refusal of Time, in collaboration with Philip Miller (composer) and Catherine Meyburgh (video construction and editing), 5-channel video installation with four megaphones and breathing machine (elephant), 35 mm film and video with animation, live action, stills, transferred to video, 28:00 min. Creates, in collaboration with Philip Miller (composer), Dada Masilo (choreography and dance) and Catherine Meyburgh (video construction and editing), Refuse the Hour, theatre piece using projections, a dancer, actors, machines, live musicians and singers, c, 80:00 min.